Frank Scott Retires after 16 years! 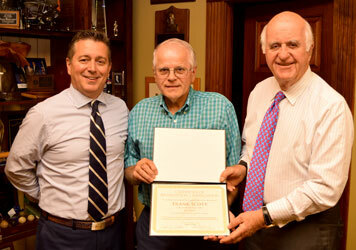 Frank Scott (Drafter-Bristol) recently retired from Strongwell after 16 years of service. Frank began his career with the Fabrication department. Within a few years he was able to progress through three stages of Fabrication expertise. This expertise gave him the knowledge and know-how to move into Strongwell’s General Engineering group as a Drafter. When asked, Frank said the two things he will miss dearly are his co-workers and the ability to design tooling for unique pultrusion profiles. Frank plans to be reunited with his love of hunting and fishing during the free time he will gain in retirement. He also has plans to finally build his dream log home with a large garden. He is also looking forward to doing some travel to visit friends and family.